Whatever term you may know them by – shatter, wax, bho, rosin, oil – concentrates have become a very popular form in which to consume cannabis. As a result a lot of different items have popped up that allow you to get the highest level of efficiency out of your waxy oils. From small pens that are ideal for quick hits on the go to full blown dab rigs that give you huge clouds of vapor. Pulsar Vaporizers who is no stranger to small wax vaporizers or even the bigger rigs decided to combine the best of both worlds. They developed the 510 threaded wax attachment capable of instantaneous heat called the Barb Fire that just screws onto a mod style battery. Can it achieve the same sort of vapor production that a dab rig can? Let’s find out. 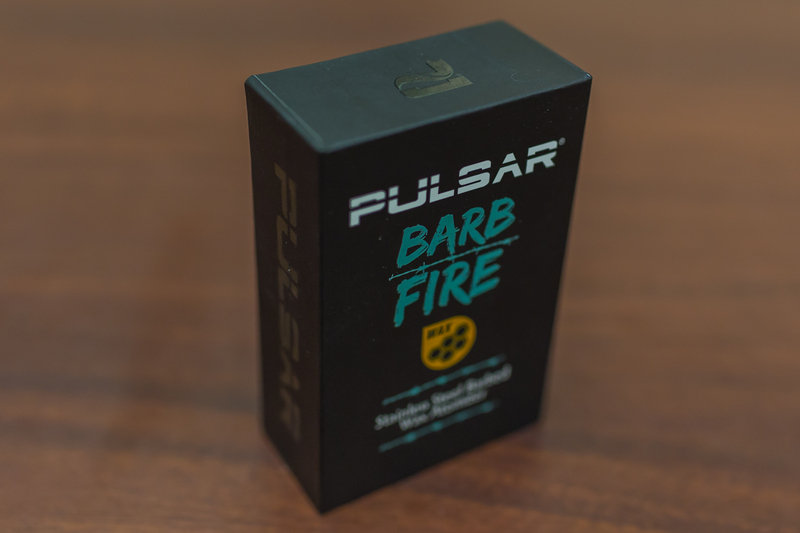 The packaging for the Pulsar Barb Fire wax attachment is pretty simple, a black box with some cartoony barbed wire across the front. Looks a little like a tattoo that a frat guy may have around his bicep. On the back of the box you’ll find the ohms & wattage range and a little breakdown of the features. Taking it out of the packaging it feels pretty heavy (it is stainless steel after all) and is roughly 2” in height. There is a metal dab tool to the right of the Barb Fire. It has a hole on the end so you can toss the tool on your keychain or rock it as a necklace… if you are into that sort of thing. Removing the stainless steel jacket is smooth, the o-rings don’t seem to catch at all. This reveals a ceramic chamber that is both deep and wide, looks like it could hold almost a full gram of concentrate. And if the claims of instantaneous heat or “flash vaporization” hold true, you would get one hell of a rip from a gram! 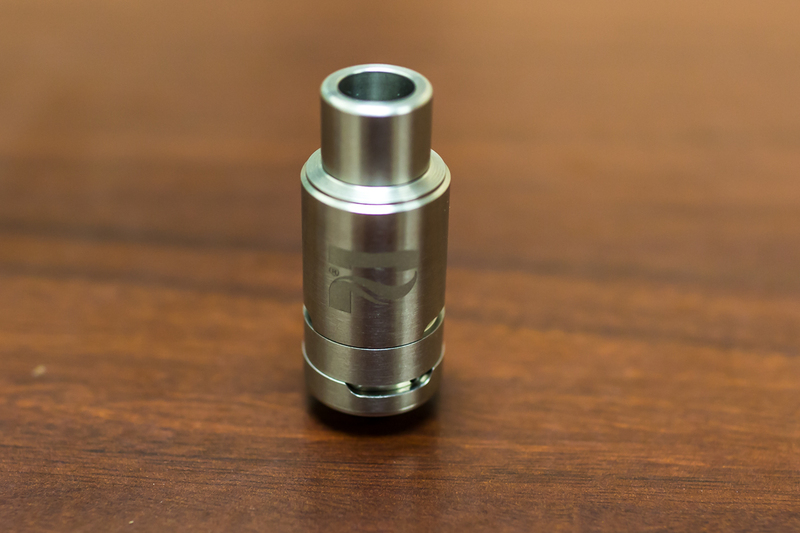 The atomizer itself utilizes a quartz rod that has a Kanthal dual twisted ribbon wrapped around it. What does that mean? Well Kanthal is made from Iron-Chromim-Aluminum (yeah Mr. White, yeah science!) and does not contain any Nickel which equals a longer life expectancy for the atomizer. Plus the dual twist ribbon looks pretty badass. What Does the Barb Fire Include? The Pulsar Barb Fire wax attachment includes a metal dab tool and no other accessories. 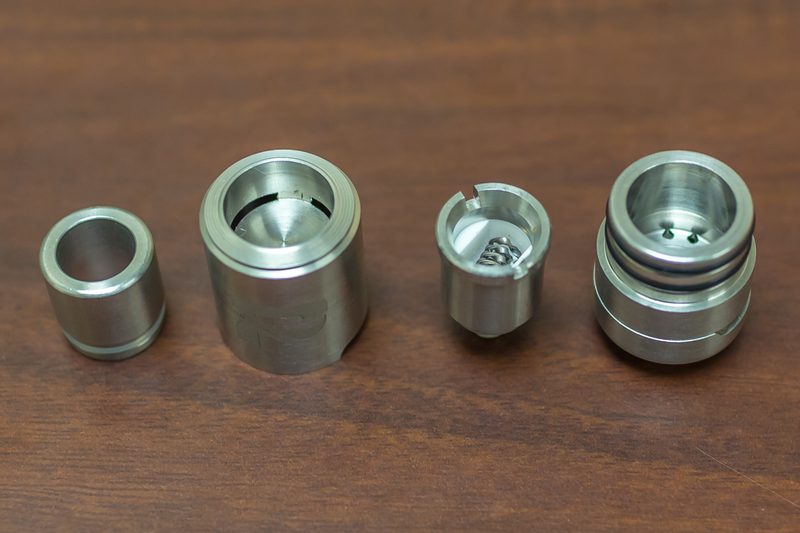 Looking at the components that make up this wax vaporizer, the atomizer base has adjustable airflow. Four small holes that can be individually sealed off by turning a metal ring. A twisted flat ribbon Kanthal coil atomizer threads into this base. 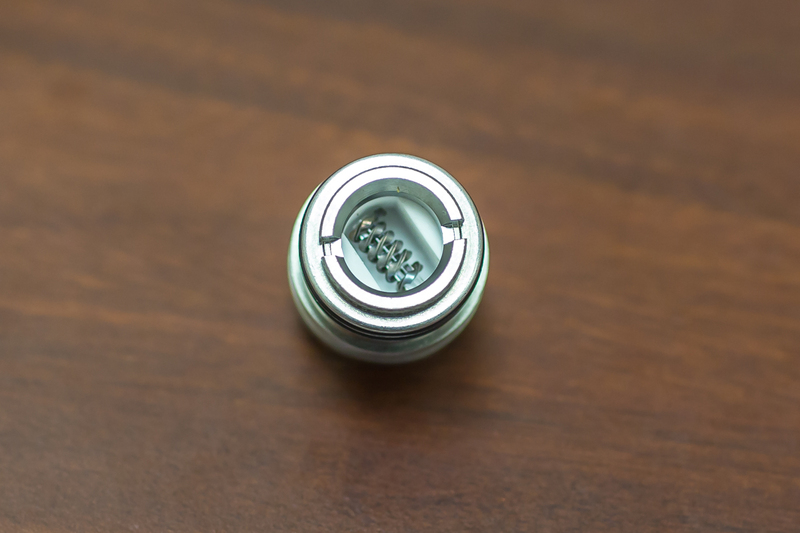 The double Kanthal coil wraps around a quartz rod which is intended to produce flavorful vapor at rapid speeds. From there the stainless steel jacket fits snugly over the o-rings and that is about it. Pretty simple. There are no instructions included with the Barb Fire but honestly if you cannot figure out how to put wax on a coil, then concentrates may not be your thing. Wax atomizers have come a long way since the early versions that heavily relied on cotton wicks. Remember the burnt flavor? I try to forget it also. A plethora of improvements and redesigns have come along – ceramic, quartz, coilless – and now I am seeing Kanthal used. This is some mod coil type stuff, which I honestly know very little about. My big takeaway after doing a Google search was that Kanthal wire has a longer life expectancy than some other metals such as Nickel. This coil is wrapped around a quartz rod which briefly retains heat after you release the button to maximize your vapor production. 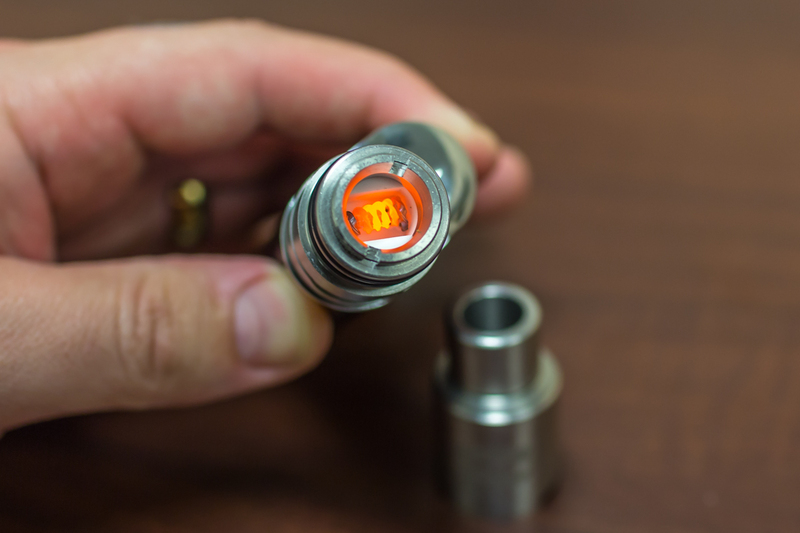 A big selling point for the Barb Fire is the claim of “flash vaporization” or in a non-marketing sounding way, a coil that goes from cold to glowing instantaneously. Makes sense why it requires a wattage controlled battery, that sort of heating would need a lot of power. Every wax pen that I have come across takes about 4 to 5 seconds before you are even getting a hit and then a little bit longer to produce any substantial amount of vapor. I consider the word flash to mean 1 to 2 seconds… even quicker if we are talking about the superhero. Depending on the type of concentrate you are vaporizing the airflow can affect the performance. Thicker waxes or shatter can be difficult to vape if an ample amount of air is not being drawn through. The Barb fire has four holes that can be closed off or opened individually to give you control over your airflow. I found it worked best with one or two of the holes opened but found there just wasn’t enough restriction with all of them open. Never go fully open. Now for the moment that I have personally been most excited about. Trying out this insta-heat capable wax attachment. In order to get a full review of the Pulsar Barb Fire I tested out the vapor production achieved at various wattage levels. The concentrate that I vaporized was the same each time, consider that my control for this experiment. What Kind of Battery is the Pulsar Barb Fire Compatible With? On the packaging of the Barb Fire you will notice it says, “Works with compatible, regulated batteries.” So what kind of battery is that exactly? You’re looking for a mod style battery, one that has wattage control and ideally up to 25W. For my tests I used it with my Source Volt 30W battery but really anything from Kanger to Innokin will work if you don’t already own a battery. Although I figured it probably won’t work correctly, I was curious – does the battery from the Pulsar APX Wax work with the Barb Fire? 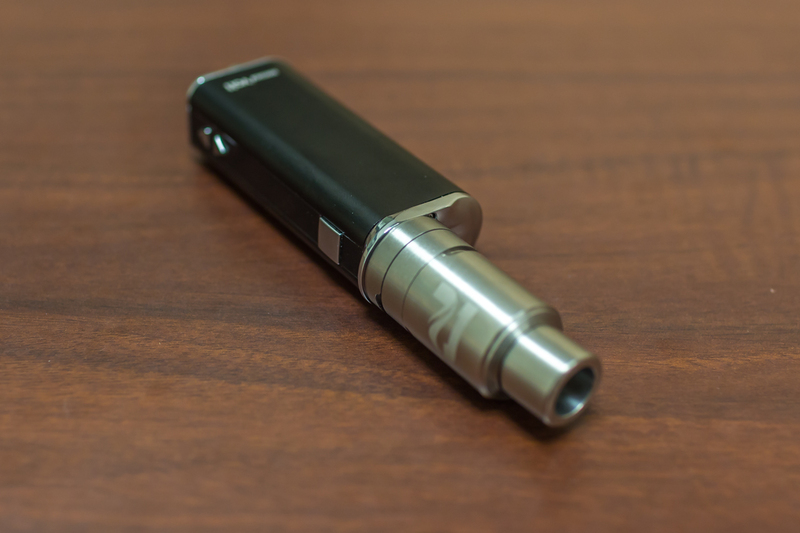 – luckily we already have a review of the APX Wax vaporizer and had a battery on deck. At first there seemed to be enough power to heat the Barb Fire but after a cycle or two the battery logo started flashing yellow and then would go red. At first I was a little bummed out thinking that I had just ruined my APX Wax battery, but after plugging it into the charger any issues seemed to be resolved. NOTE: I do not recommend using the Pulsar Barb Fire with the APX Wax battery. The back side of the Pulsar Barb Fire box states that the wattage range is from 15W to 25W. So I figured let’s start at the lowest recommended level and go up from there. This gives some variety to the testing and allows me to see how much of a difference there really is. If any. Before putting any wax on the coil I wanted to see how bright it would glow. Claiming “flash vaporization” after all it would have to get very hot incredibly fast. Well, if heating up a dry Barb Fire atomizer is any indication of how it will perform take a look at this image (it’s basically a flash light). While heating it up that first time I noticed that initially the coil does not begin to glow, it is fast but not quite instant. That being said, I held it down again shortly thereafter and it was almost immediately bright orange. At this point I am beginning to trust their claims. And after being briefly entranced by the coil I figured to let it cool momentarily. I like the widemouth chamber of the Pulsar Barb Fire, it is easy to load your concentrate onto the atomizer. Knowing that this might vaporize the full pack in a hit or two, I put .2 grams of crumble onto the coil. Enough to get a solid guage of the instant heat without overdoing it. With the battery set to 15 watts, the experiment official began with a press of the button. Since there is a counter on the battery at 2 seconds I took a quick inhale followed by an immediate exhale to see if there was any vapor produced already. It wasn’t a whole lot, but I started drawing again. After 8 seconds I stopped and exhaled. This time I got a cloud of vapor and wanted to start coughing. There wasn’t a burnt flavor to the hit which is something I thought might happen from such rapid heat. I removed the stainless steel jacket and inspected the atomizer, not many remnants of wax. That’s pretty efficient. So let’s check it out at the high end of the wattage spectrum, 25W… the max recommended. Push it to the limit. I had to put more wax in the chamber before it was go time. Since the coil was still a little warm the wax melted some as I dropped it in. With the steel jacket back in place I pressed the button and started drawing at 3 seconds. I continued to inhale for a moment. When I stopped the battery timer was a little over 10 seconds and I exhaled a beast of a cloud. Coughing ensued. The higher wattage definitely heated quicker and hotter. The steel jacket was kind of hot to handle. Which also seemed to make the vapor warmer than the first hit. A little more irritating on the throat and lungs. But I have experience with dab rigs so I can handle it. I’m a man! And one who recommends holding the button for 3 to 5 seconds before you begin hitting the Pulsar Barb Fire wax attachment. Wax vaporizers really don’t require much in order to keep them running well. If the threading below the heating chamber gets a little gunked up, use a q-tip with a bit of isopropyl alcohol to clean the connection. Other than that you just need to wipe off the stainless steel jacket every one and a while. And replace the atomizers if it burns out. 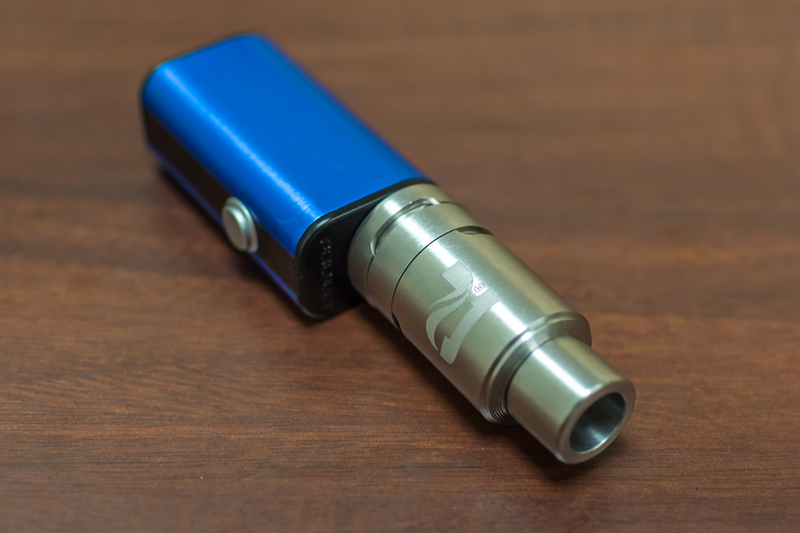 Note: At the time of writing this review, Pulsar does not have the atomizers available for sale as a separate item. 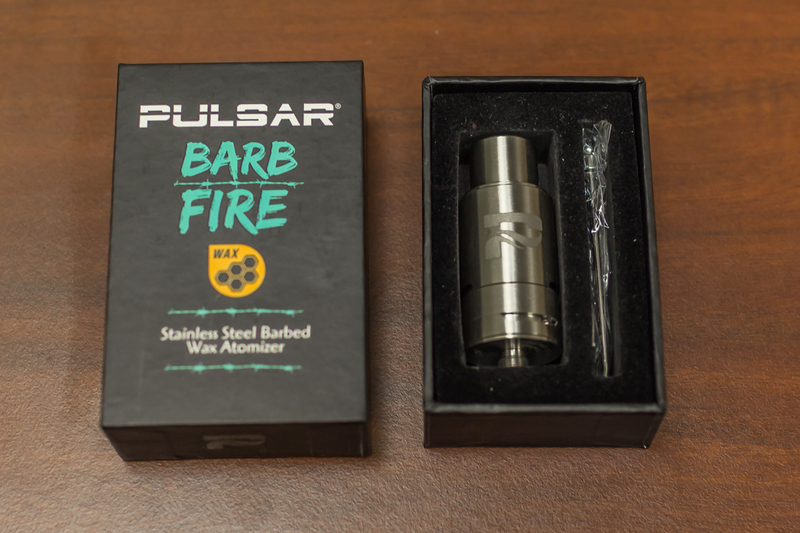 According to Pulsar Vaporizers, the Barb Fire wax attachment includes a lifetime warranty. Right off the bat I am going to assume that does not include that atomizer (once it has been used). Due to the nature of that component I can easily say that I rarely, if ever, see a manufacturer who has a warranty on their atomizers. It just doesn’t happen. If that is the case, the parts protected under the lifetime warranty are the stainless steel jacket w/ mouthpiece and the atomizer base. I doubt you will ever need to claim this warranty for those components. The Barb Fire is really a first of its kind wax vaporizer attachment. I have seen other similar designs – KandyPens Pearl and MIG Brain Fogger – however both of those utilize a ceramic atomizer and do not include a Kanthal wire anywhere. Aside from mod vaporizers for e-juice, no wax atomizers seem to utilize this material… specifically the dual flat ribbon construction (which is strange considering the longer lifespan). So either I have been in the dark or this is in fact a unique product. Which is a rare thing these days on the vaporizer market. Everything is knockoff this and clone that. With a price tag of $44.99 the Pulsar Barb Fire wax attachment isn’t necessarily going to break the bank. However if you do not already own a compatible battery that is an extra expense you will incur. There are a lot of affordable options so that’s not necessarily the end of the world, but does add some additional cost to your bottom line. As of right now I would put it at a good value, but will see how much the atomizers cost when released. In the long run the Barb Fire could be an expensive attachment to own if they end up costing an arm and a leg. The rapid heat of the Pulsar Barb Fire wax attachment is an intriguing aspect of the product. Flash vaporization can be achieved which results in massive clouds damn near instantaneously. The dual ribbon Kanthal wire makes this a more efficient wax vaporizer than your standard coil, because the wax gets caught between grooves of the two flat coils instead of just melting to the bottom of your chamber. No waste = no worries! And since I am on the topic of the heating chamber, the other thing I liked was the capacity of it. This is a deep bowl with a wide mouthpiece. Easier to load with your concentrates that way. And if you are always trying to one up your friends with who take take the biggest hit, your true test will be with the Pulsar Barb Fire. Be prepared to not do anything for a while if you win (or lose) that contest. Maybe it’s just me being overly critical, but having to purchase a separate mod battery is the downside here. Yes, I did already own one before getting the Pulsar Barb Fire, but not everyone does. And I don’t only think of myself. Another thing is the high level of heat. If you are with a bunch of people and trying to use the Barb Fire back to back to back (you get the idea) then it can become a little hot to handle. Plus the third person in line will be getting a far hotter hit than the guy or gal who took the maiden voyage. However, this can easily be avoided if you allow ample cool down time between hits. Just be patient folks… it is a lost virtue in this day and age. If you vaporize a lot of wax and take monster rips every time then this is probably an attachment that you’d enjoy. If you have a mod style battery on hand, even more reason to get a Pulsar Barb Fire. I wouldn’t say it is designed for the casual consumer and definitely not for beginners, it’d be a little overwhelming. However the size hit you will get really depends on how much concentrate you are loading onto the atomizer. I suggest starting with a small amount to get your bearings before diving in too deep… cause you may get caught up in the, BARB FIAHHHHH. Did you like what you saw? If you answered yes, go pick up a Pulsar Barb Fire wax attachment from from this online vaporizer store. And it is a one stop shop if you’ll need to purchase a compatible battery as well. I do get compensated if you purchase through my link but this is a product that I do recommend for the wax enthusiast.